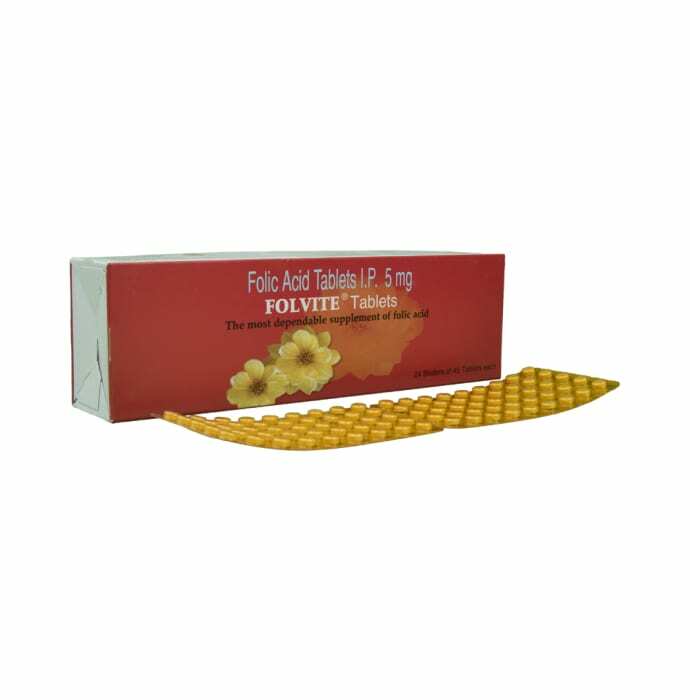 Folvite tablets contains a rich formulation of complex organic compounds known as Folic Acid (Vitamin B9). Folic Acid is an essential water soluble Vitamin for nucleotide biosynthesis and remethylation of homocysteine. This folic acid supplement tablet helps in the production of red blood cells (RBCs), synthesis of DNA, and boosts heart health. Folvite (Folic acid) should be essentially used in pregnancy as it helps to protect the baby from developing birth defects. Folic acid is good for pregnant female, too, as it works with vitamin B12 to form healthy red blood cells and prevents anaemia. Folvite (folic acid) is used to treat or prevent low folate levels due to poor diet, and certain stomach/intestinal problems as well. A licensed pharmacy from your nearest location will deliver Folvite 5mg Tablet. Once the pharmacy accepts your order, the details of the pharmacy will be shared with you. Acceptance of your order is based on the validity of your prescription and the availability of this medicine.